With another aching deep dive into human spirituality, Emily France mines her home state of Colorado in a novel of a teen girl's harrowing search for her missing younger sister—and her own search for self. Born and raised in Boulder, Colorado, Essence McKree feels older than any seventeen-year-old she knows. Ever since weed was legalized, her mother has been working in a pot shop, high more often than not. Lately it’s been up to Essa to care for her nine-year-old sister, Puck. When Essa meets Oliver—a brainy indoor type who’s in town for the summer—she is cautious at first, distrustful of the tourist crowd and suspicious of Oliver’s mysterious past in Chicago. But Puck is charmed and pushes Essa toward him. Soon Essa finds herself showing Oliver the Boulder she has forgotten: the mountain parties, the long hikes . . . and at Oliver’s urging, the exploration of Buddhism at the local zendo. When Oliver agrees to accompany Essa on a three-day survival game in the Rocky Mountains, she feels a lightness she hasn’t known in a long time. Then she discovers that Puck has stowed away and followed them into the wilderness. After spending a night stuck in a mountain storm, Essa wakes to find Puck missing. Now Essa must rely on her newfound spiritual strength if she is to save her sister’s life, and ultimately her own. Emily France is the critically acclaimed young adult author of Signs of You and Zen and Gone, a July 2018 Washington Post Best Book for Young Readers. She graduated from Brown University and also holds an MFA in Creative Writing and a JD. She lives in sunny Colorado with her husband and son. Her Zen practice is the taproot of her inspiration. Connect with her online at emilyfrancebooks.com. "The romance, family dramas and physical danger keep us turning the pages, but the generous embrace of the spiritual truly enriches this reading experience." "As wild as it is heartwarming." "Zen and Gone reminds us that we are all connected, we all matter, and we are all loved. By lifting up others, we lift up ourselves." "Memorable. This is a beautiful, gentle, contemplative story certain to both fascinate and educate readers about a new way of encountering the world and all the challenges within it." "Imbued with an exceptionally strong sense of a fascinating place and organized around the Four Noble Truths and the Eightfold Path, the novel offers a beginner’s lesson in Buddhist principles as they might actually be lived in a contemporary American setting." 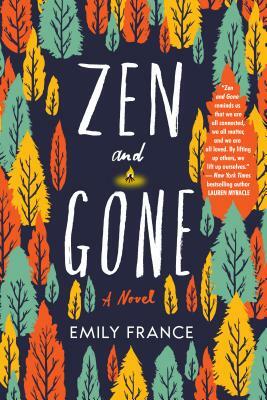 "With a host of deftly drawn characters, Emily France’s Zen and Gone is a paean to the multicultural mountain mecca of Boulder." "A​ fast-paced read. Blending romance, thrills, drama, and philosophy, this novel delivers a strong message about being present with life even when it hurts​." "Two teens face outsize family responsibility in this thoughtful novel about mindfulness and survival." "I absolutely adored this book." "France’s actors are authentic and easy to relate to. The novel’s Boulder setting is equally well-drawn. Amidst crisis, there is humor, teen angst and—you guessed it, readers—even a little romance." "Gripping, enigmatic, and moving, Signs of You will stay with readers long after they’ve turned the last page. France masterfully plumbs the depths of the human heart as she layers mysticism, friendship, wit, and grief in this story about four teens looking for meaning and love after the deaths of people close to them." "Alternatingly laugh-out-loud funny, tear-inducing sad, and goose-bump spooky. This is a mystery with a heart, and one that is very hard to put down." "Eerie and intense, Signs of You explores the mysteries of life and what comes after. A vibrant debut from a compelling new voice in young adult literature. This is a book that stays with you long after you’ve savored the last page." "Signs of You has an engaging mystery at its center, one that will keep readers turning the pages as Riley and her friends try to understand the supernatural world that surrounds them. But it is the heart-wrenchingly profound questions that will stick with you long after you've finished. In her funny, suspenseful and romantic debut novel, Emily France beautifully shows us how a person can live fully in the face of unfathomable loss."